A political & campaign strategist, described as “Public Relations Supremo” by The Economist, Ron Werber serves for more than a decade as senior campaign & media consultant in scores of successful Presidential, Parliamentary, Municipal, Referendum & Advocacy campaigns, in the emerging democracies of Central-Eastern Europe, Africa and Israel. He also provides occasional consultation to governments and to new members of the European Parliament in Brussels. He is widely recognized as an expert of political and communication strategies, interdisciplinary advocacy campaign planning & management, grassroots work & community mobilization, direct communication tactics (“Media Bypass”), crisis management and effective media & public appearances. Werber is also known for his unique Team WPA Workshops – training leaders & grassroots activists for effective campaign planning, implementation and management and preparing them for successful media and public appearances. Among his victorious clients were Hungarian Prime Minister Péter Medgyessy, Romanian President Ion Iliescu & Prime Minister Adrian Nastase, Lithuanian Prime Minister Algirdas Brazauskas, the late Israeli Prime Minister Y. Rabin, Kenya’s Vice President, Kalonzo Musyoka, Bucharest Mayor, Dr. Sorin Oprescu, former Speaker of Hungary’s Parliament, Dr. Katalin Szili and many well-known party leaders, Speakers of Parliament, Mayors & County-Presidents in these regions. He is also recognized for his pro-bono advocacy work in Israel, on environmental and social issues, the transparency & accountability in national & local governments and the promotion of religious and cultural pluralism. Among his pro-bono advocacy projects in Israel, were the successful “No To The Wisconsin Plan” campaign (2009-2010) and the unprecedented public campaign for a just distribution of profits from Israel Natural Resources (“The Oil Law”, 2010-2011), both culminating in a significant legislative success. Prior to his European chapter, Ron Werber served as a senior consultant for scores of major clients, among them Israel’s channel 2 broadcast companies - Reshet, Keshet & Telad, Israel’s National Teachers Association, Israel Democracy Institute, National Association of TV & Film Producers, National Association of Gas Stations Owners, and many municipalities and regional councils. Werber served as head of Israel’s Labor Party Information, Public-Relations & Advertising division – culminating in the 1992 election victory and Labors' return to power after 15 years, headed by the late Y. Rabin. Prior to that, he served for several years on a special mission of The Jewish Agency in the US. He is married to Effie, head of IR in one of Israel’s leading banks, who moved to Israel from the US in 1981, and they have 3 children (Amit 25, Oren 23, Elad 19). 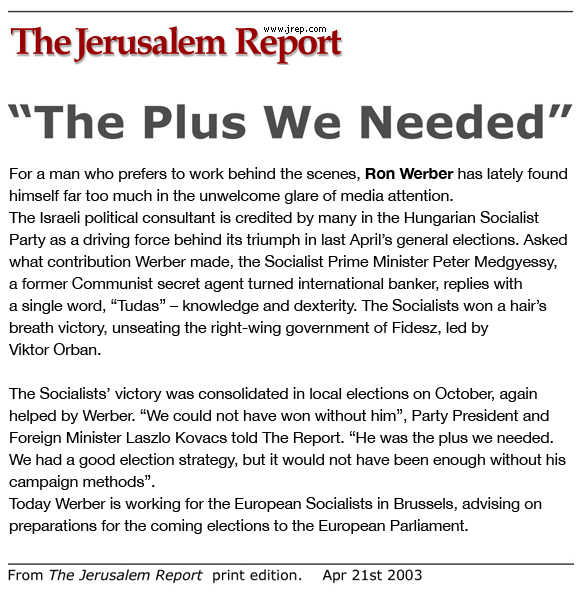 “...Public Relations Supremo, Ron Werber, credited with winning the elections... signed up for Hungary’s Socialists after steering Romanian’s Socialists to Victory… Mr. Werber dragged the socialists local branches into 21st century”. “Political consultant Ron Werber, is credited by many as a driving force behind its triumph in last April’s general-elections and November’s Municipal Elections. “We could not have won without him” party president and foreign minister Lazlo Kovac told The Report. “He was the plus we needed. We had a good elections strategy, but it would not have been enough without his campaign methods”. 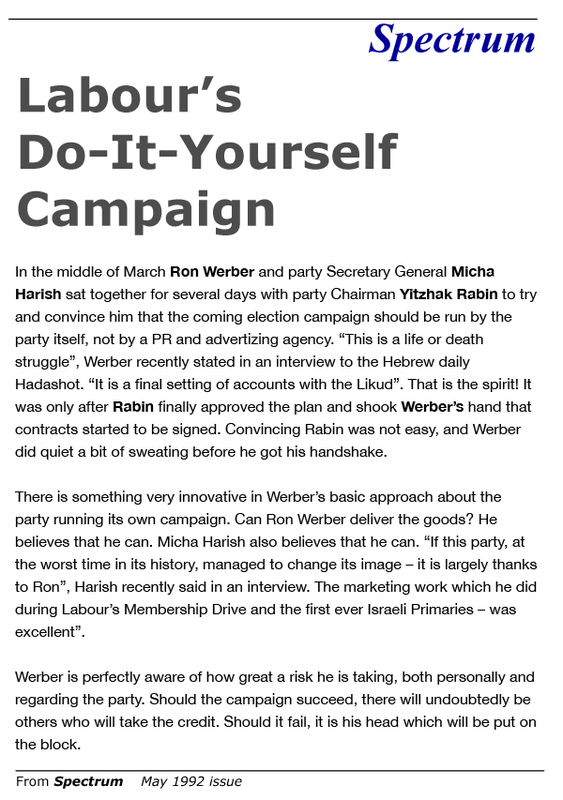 “In the middle of March Ron Werber and party Secretary General Micha Harish sat together for several days with party Chairman Yitzhak Rabin to try and convince him that the coming election campaign should be run by the party itself, not by a PR and advertizing agency. Convincing Rabin was not easy, and Werber did quiet a bit of sweating before he got his handshake”.